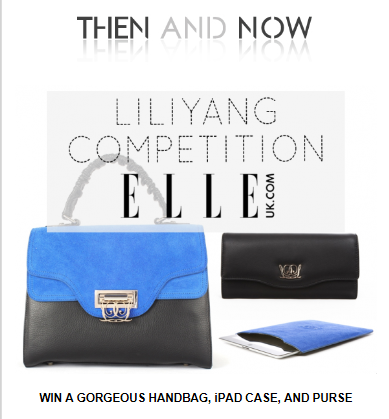 'THEN AND NOW' & Elleuk.com Partnership: Competition Time! In order of a cheer up one of my dearest PR girls from ‘THEN AND NOW’ sent me over something which you’ll all love to enter! I’m very happy to post that ‘THEN AND NOW’ have partnered with Elleuk.com who is one of the most leading fashion magazines websites featuring, all the latest trends to news within the digital fashion world. This partnership is allowing one lucky reader the chance to win a gorgeous handbag set from luxury British accessory brand Liliyang London ( See post here about Liliyang London) , which includes not only the stunning Sienna Tote and matching Liliyang Ipad case but also a classic Ebony purse from the timeless Liliyang collection. Make sure you don't miss out on this rare opportunity of a prize worth £1,000! Enter here now and share with your friends, family, and colleagues.